In the distant future, motorcycle riders will have no need of helmets or padded clothing. They also won't need to put their feet on the ground when they stop. That's because, according to BMW, the motorcycle of the future will balance itself and will help the driver avoid crashes. BMW, which is famous for motorcycles as well as cars, unveiled a new concept motorcycle in California Tuesday. The BMW Motorrad Vision Next 100 offers a glimpse at what, BMW designers predict, motorcycles might be like decades from now. Basically, they'll offer all of the excitement of today's bikes, but none of the danger. Besides self-balancing wheels, so that a kickstand is needed only when the motorcycle is shut down, the bike has an "electronic safety cage" that communicates with other vehicles and road sensors to help it automatically avoid crashes. This is a concept vehicle, so it's unclear how much of this stuff the bike BMW showed off can actually do. It's also unclear how long it will be before an actual production model of the motorcycle could do these things. 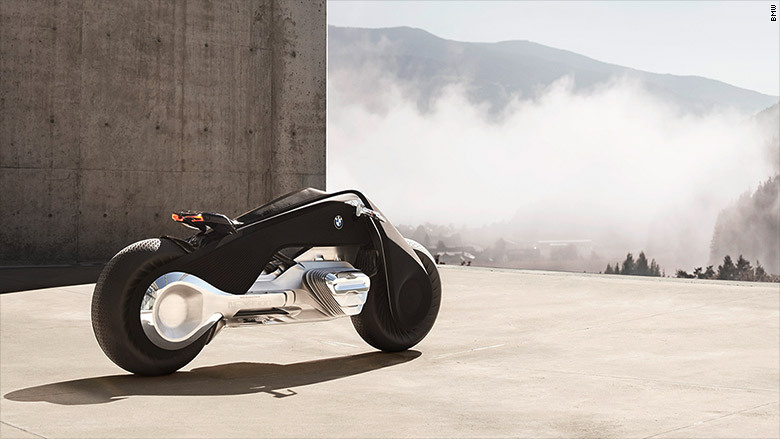 The concept BMW motorcycle is powered by an electric motor rather than a gasoline engine. The electric motor still has the famous shape of BMW's flat-twin engines with the cylinders sticking out the sides. The bike's flexible frame can bend as the bike is steered, eliminating the need for joints. The amount of power needed to steer the bike varies with the motorcycle's speed, BMW said. When moving slowly, steering is light and easy. As speed increases, more force is needed to steer. The motorcycle's frame flexes to help steer the bike. With no helmet needed, the goggles will keep wind, bugs and debris out of the rider's eyes while also providing all the information the rider needs. The type of data displayed inside the goggles will change based on where the rider looks. When looking straight down the road, no data is presented unless its needed to alert the driver to an emergency. The suit itself contains no extra padding, since that's not deemed necessary. It can warm or cool the rider as needed, and supports the rider's muscles to help prevent fatigue. Vibrating units in the arms and legs provide feedback for navigation or to alert the rider when the bike is leaning too far. 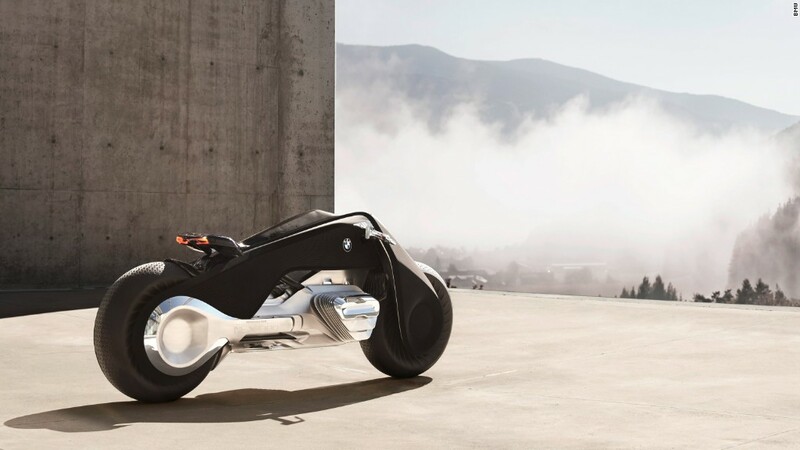 The bike is the last of the BMW Next 100 concept vehicles being unveiled in celebration of BMW's 100th anniversary. A futuristic shape-changing BMW car was unveiled in Munich last March. Futuristic self-driving Rolls-Royce and Mini models were unveiled in London in June. BMW owns Rolls-Royce and Mini. BMW Motorrad is the German luxury automaker's motorcycle brand.